St. Tropez Tours Include: Our private St. Tropez tours include private transportation and English speaking tour guide, taxes, tolls and parking. 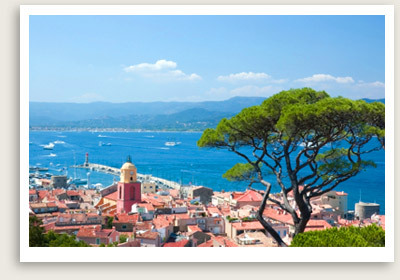 Departure Points for St. Tropez Tours: Marseille, Provence, Nice, Antibes or Cannes. Other departure points available. Inquire. Let Well Arranged Travel take you on a custom private tour of St. Tropez. On this St. Tropez tour, you will drive through the Maures (Moors) Forest to arrive at the harbor of St. Tropez, studded with luxury yachts, fashion boutiques, and terrace cafés. Feel the atmosphere of a Provence market where beautiful people abound. You will have free time for lunch and to explore the town. You can climb the steps to the pretty medieval village, peruse the art at the Annonciade Museum, or explore the Citadel with its maritime museum. You will next make a stop at Port Grimaud, known as “Little Venice,” for its canals, bridges, boutiques, and charming houses. You will return by the spectacular coast drive, passing through St. Maxime, St. Raphaël and the Golden Corniche. You can meander through the little canals of Port Grimaud by boat and sail – a 20-minute ride – across the stunning bay of St Tropez (from mid-June to mid-September only).